The Haunting of Transylvania - Happy Halloween! 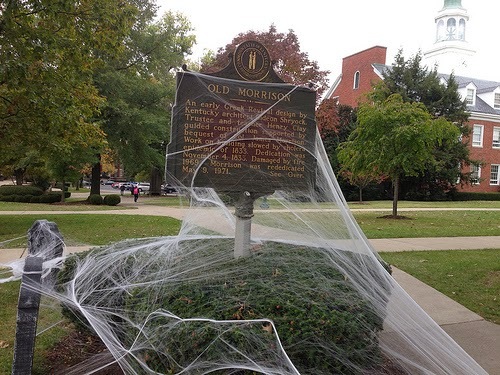 A Haunted Old Morrison Hall at Transylvania University - Lexington, Ky.
On this All Hallows' Eve (aka Halloween), I remind you of the former professor of Transylvania University who cast a spell upon the school and is buried in the crypt beneath Old Morrison. 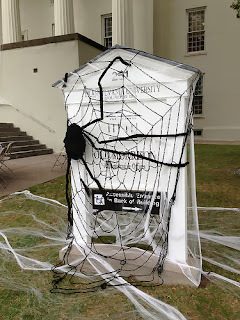 Of course with a name like Transylvania, the school embraces this autumnal holiday. Check out these great photos of their decorations and pumpkin carvings that annually are placed on the steps of Old Morrison. The story of Professor Constantine Rafinesque is after the jump. 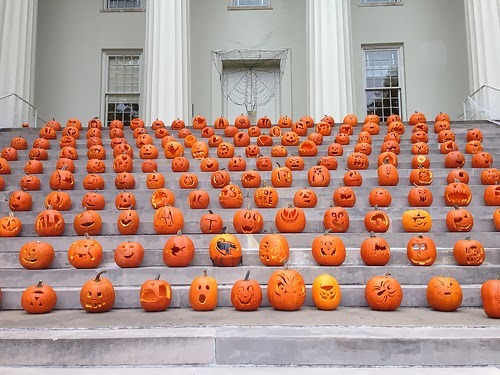 Jack-O-Lantern's on the steps of Old Morrison - Lexington, Ky. The Tomb of Constantine Rafinesque - Lexington, Ky. In 1815, he returned to the United States and continued to work diligently in the fields of biology and zoology. He came to the Athens of the West (Lexington) and its famed institution (Transylvania) as a professor of botany in 1819. Throughout his career, Rafinesque published the binomial names of over 6,700 species of flora and fauna, but he was never recognized during his life for his work. Perhaps it was because he was a little too eccentric for anyone's taste. On one occasion, Rafinesque stayed at the home of French-American ornithologist (bird guy) J. J. Audubon famed for his detailed color illustrations of birds in North America. In his room was Audubon's prized violin and a live bat which Rafinesque did not recognize, so Raf swung and destroyed the violin in an attempt to seize the bat for his specimen collection. To thank him for destroying the violin, Audubon later gave his guest a beautiful color illustration of a gigantic fish which swims in the Ohio River. Rafinesque wrote and published a paper on this eight-foot-plus beast only to thereafter discover Aubudon's joke. Needless to say, the two were not close. As a professor, Rafinesque was more likely to skip class than were his pupils. He used the time to take nature walks. It is believed, but not confirmed, that Rafinesque also was quite friendly (perhaps a little too friendly) with the wife of college president Horace Holley. Further, Rafinesque (a Unitarian in faith) did not endear himself to the more conservative faiths and faithful of Kentucky. So, whatever the reason in particular, Rafinesque was forced out of Transylvania in 1826. Upon his departure, however, he left a curse on both president Holley and Transylvania itself: "Damn thee and thy school as I place curses on you." (or something to that effect). As with curses, they always come true. The following year, Holley was himself forced out from the college whereupon he and his wife set out to teach in Louisiana. But he caught yellow fever and died. Transylvania's main building (then within what is today Gratz Park) burned within two years of the curse. And Old Morrison itself suffered from extensive fire damage in 1969. 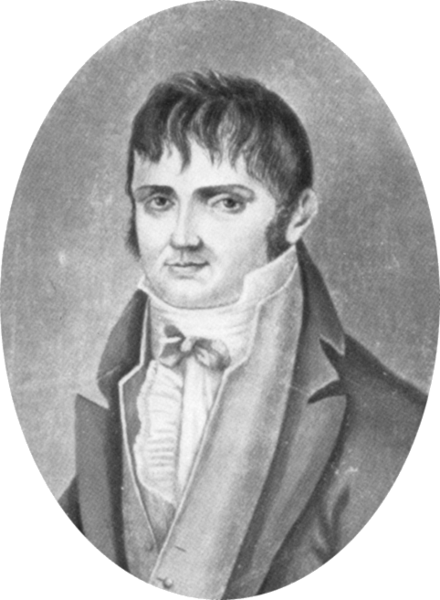 Rafinesque returned to Philadelphia after being relieved of his professorship and continued his work until his death from cancer in 1840. Without a church home, Rafinesque was buried in Ronaldson's Cemetery at 9th and Bainbridge in Philadelphia. Ronaldson created his cemetery for travelers and others in Philadelphia who could not, without membership, be buried in a local church cemetery, but who would not be relegated to the public pauper's field. Even so, up to six bodies would share the same space at Robertson's and over time, the area became part of Philly's slums (today it is quite regentrified). But when Robertson's Cemetery was to be destroyed in the 1920s, a group of Transylvanians came to recover the body of the old professor with the hope that the curse would end. And so his body was removed from its grave, brought to the campus of Transylvania University, and re-interred in a small crypt under the steps of Old Morrison. At least, we think it was Rafinesque.